Coconut oil has been shown to yield a variety of health benefits for the human body, ranging from increasing energy levels and even supporting weight loss. Enhance the nutritional value of your favorite baked goods and dishes by using Biona Organic Coconut Oil Cuisine Mild & Odourless! 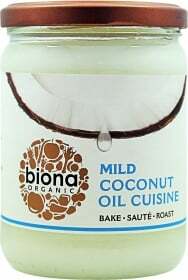 Unlike ordinary coconut oils, Biona Organic Coconut Oil Cuisine Mild & Odourless has been lightly steamed to eliminate that distinct coconut taste and aroma, making it an excellent oil to be used for cooking and baking. This vegan-friendly coconut oil does not contain any dairy and is rich in Medium Chain Triglycerides, which are healthy fats that are readily converted into energy. What benefits can you get by switching to coconut oil? Keep healthy and your favorite dishes extra-wholesome with Biona Organic Coconut Oil Cuisine Mild & Odourless! Have a question about Coconut Oil Cuisine Mild & Odourless? What is it, what does it do, how and when to use or something else? Ask us.